Anyone who listens to music regularly knows that songs are often inspired by specific places that are meaningful to the artist. These songs can become popular anthems for the cities themselves, and an expression of pride and community. There’s no doubt, however, that some cities lend themselves to the musical treatment more than others. 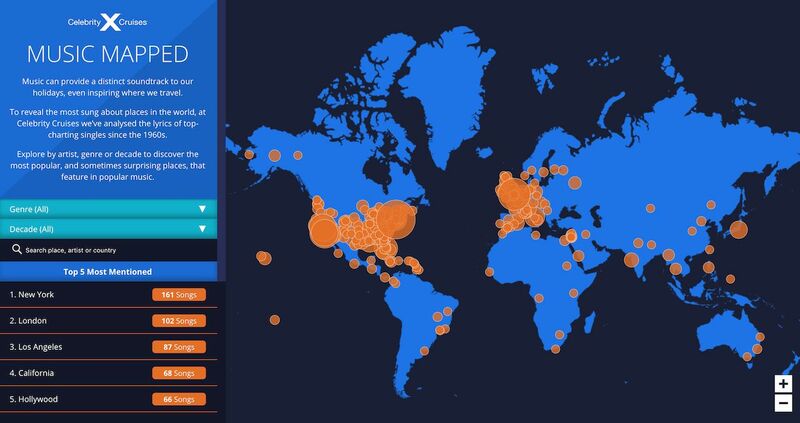 Celebrity Cruises gathered data on all of the songs based on a real-life location, and used it to create an interactive map. The research analyzed the lyrics of top-charting singles since the 1960s, and organized the information by artist, genre, and decade, so users can easily see which locations, and which decades and genres, are the most popular. To learn which cities have the most song mentions, Celebrity Cruises analyzed the lyrics of over 200,000 songs that have been in the top 40 of the Billboard Hot 100 and the UK Official Singles charts since 1960. It scanned lyrics for any mention of cities, towns, neighborhoods, and states. The result was over 2,000 songs by 897 different artists, with a total of 422 places mentioned around the world. If you feel like songs about New York are getting a bit repetitive, you’re not alone. New York City is the most sung-about city in the world, as the subject of 161 songs. London comes in second, with 102 songs, followed by Los Angeles, Paris, and Miami, with 87, 52, and 46 songs respectively. You can also apply filters to the map to learn about whatever genres interest you, including rock, R&B, hip-hop, pop, electronic, country, jazz, reggae, and disco. To see the full interactive map, and browse individual cities, check out Celebrity Cruises’ website.